Prefabricated steel–reinforced concrete angle columns and concrete-filled U-shaped steel beams were recently developed for efficient steel-concrete composite construction. In the present study, seismic details of TSC beam–PSRC column connections were developed, taking into consideration constructability and cost efficiency. A cyclic loading test was performed on the beam-column connections to investigate load-carrying capacity, deformation capacity, failure mode, and energy dissipation capacity. For the test parameters, the connection type (interior or exterior) and the depth of the TSC beams were considered. 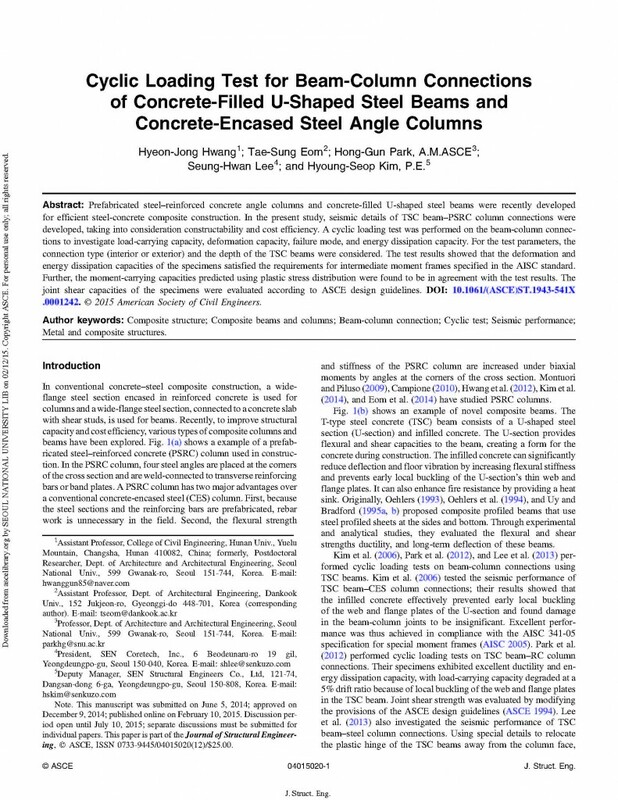 The test results showed that the deformation and energy dissipation capacities of the specimens satisfied the requirements for intermediate moment frames specified in the AISC standard. Further, the moment-carrying capacities predicted using plastic stress distribution were found to be in agreement with the test results. The joint shear capacities of the specimens were evaluated according to ASCE design guidelines.